It’s a good sign when a piano establishment is open on Memorial Day! In the glow of its colorful banner, Beethoven’s was such a welcoming opportunity of which I availed myself. An important “player” on Manhattan’s “piano row,” it’s one of a few restorers that also offers a selection of NEW instruments–like the Sauter (German) and Hailun (Chinese), to name a few. Andrew Townsend, a hospitable host at Beethoven, guided me through a sea of magnificent pianos, each with its own unique voice. His expertise was appreciated as I grilled him about everything under the sun, in between customers. Thank you Andrew! And bravo to Beethoven’s for its formidable presence in the great universe of pianos! “Established over thirty years ago by Munich native Carl Demler, Beethoven Pianos offers New Yorkers the widest selection of instruments and piano services at the most competitive prices. 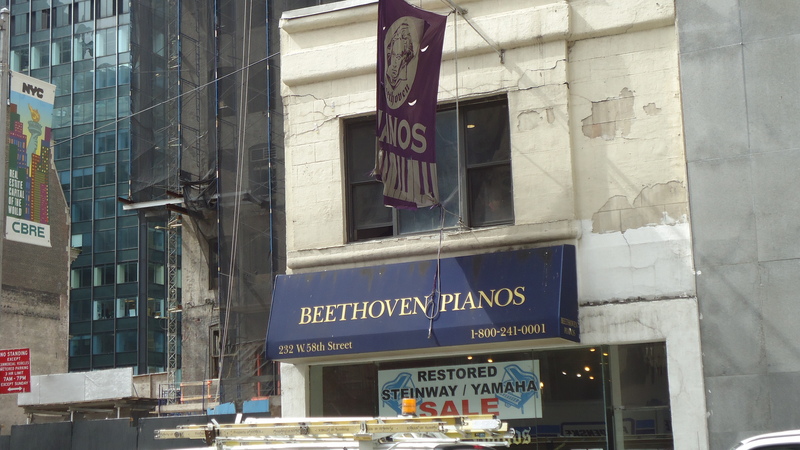 Today, Beethoven Pianos is the oldest full service, family-owned piano store in New York City. It offers piano rebuilding, refinishing, concert and private rentals, tuning, moving, piano storage, and a variety of technical support to any piano owner. Its expert staff of technicians, craftsmen and movers is key to its stability in the piano industry. Next postAlessandro Deljavan is a Cliburn winner for me!